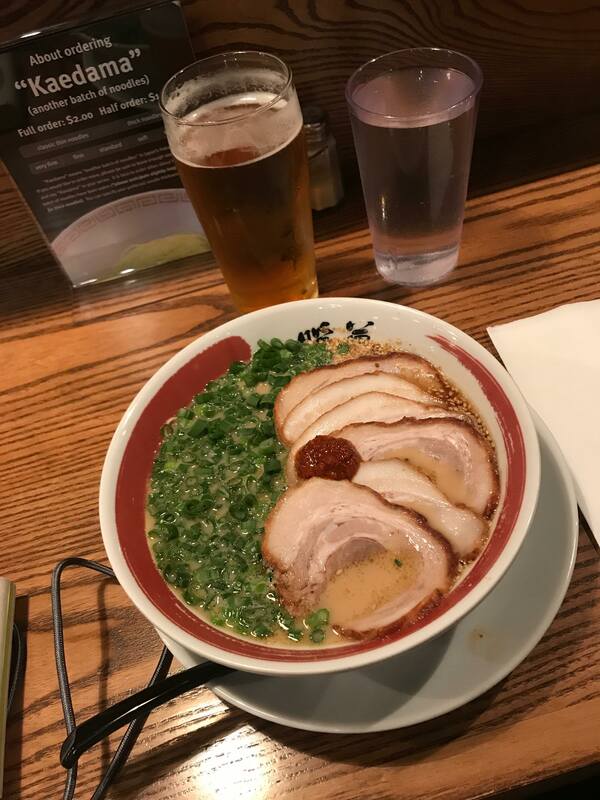 There’s no shortage of ramen joints in Seattle. After trying a few and an evening googling and reading TripAdvisor reviews I decided that the place I absolutely needed to visit was Danbo. There were some really excellent reviews, and clearly, the word had gotten around – when I arrived at about 19:20 there was a queue to the end of the block. I took myself on a little explore and found the Elysian Capitol Hill Brewery so stopped in for a beer; my strategy being perhaps it was the early evening rush and I should just give it a while. About 45 minutes later (oh, ok, it might have been more than one beer) I trundled around the corner and, if anything, the queue had grown. The beauty of travelling alone is that in such situations you don’t have the dilemma where you want to stay but don’t want to subject anyone else to waiting if they don’t really want to. No siree, I was committed to eating here! I got chatting to a guy in front of me in the queue. This would definitely not happen in London! Dan was a few years younger than me and worked at a car hire firm at the airport. He regularly eats at Danbo which I took as another excellent sign! He also gave me a wonderful spur-of-the-moment recommendation for the Pink Floyd Lazer Dome at the Pacific Science Centre, which I booked there and then for later the same evening. #Spontaneous! Danbo offers customisation options on noodle firmness, broth thickness, spiciness and richness. I think I’ve said previously, if you get a bowl of ramen with perfectly read-to-eat noodles, then by the time you get to the last noodles they are overcooked. Opting for firmer noodles so they have some durability is definitely a top tip. I went for the classic ramen and a side of yaki gyoza. The broth was near perfection – leaving a slight oily residue on the roof of your mouth as a little reminder of the deliciousness, and a sweet nuttiness from toasted sesame seeds. The pork was soft and salty, and the egg yolk oozed into the broth just as it should. It’s really hard to find fault with Danbo, other than the length of the queue, but that’s a reflection of how good the food is! There will likely be no surprise that I’m giving Danbo full marks, RAMEN (5/5).